The Eagle’s Nest Barn features the Stadium Room [for the TRUE BLUE Michigan Fan] AND the Jackson Room showcasing the fine art photographs of Grass Lake, Wolf Lake, Jackson’s Hot Air Jubilee, the Cilvil War Muster, and more. The upper levels of the barn feature photographs and posters of Ann Arbor and the U of M Hospital. 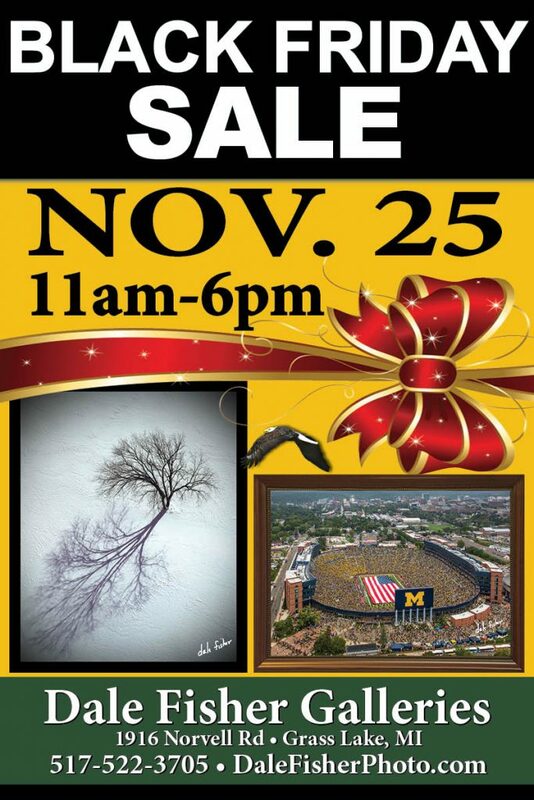 We have many framed, mounted, and matted photographs that are available in the “Don’t Tell Dale Sale” rooms that are priced to sell [seriously… PLEASE, PLEASE DON’T TELL DALE]. The Wings Gallery displays Dale’s more current work. However, because we are ‘updating’ with new paint, new window treatments and NEW artwork, we have many framed photographs VERY REASONABLY priced. Since the Eyry of the Eagle Farm also is a ‘Farm Wedding Venue’ we invite our current and prospective clients to tour buildings and the property. Pick up Dale Fisher’s latest [AND GREATEST] book; “Jackson County: Visions of the Eagle,” AND save shipping costs. Looking forward to seeing you Friday.